Company marks three decades of delivering document management, business process outsourcing, archiving, quality assurance and scientific support services. Fulton, Md. 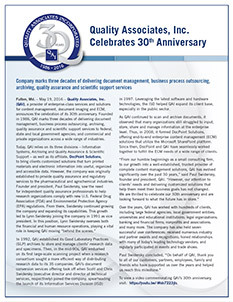 – May 19, 2016 – Quality Associates, Inc. (QAI), a provider of enterprise-class services and solutions for content management, document imaging and ECM, announces the celebration of its 30th anniversary. Founded in 1986, QAI marks three decades of delivering document management, business process outsourcing, archiving,quality assurance and scientific support services to federal,state and local government agencies; and commercial andprivate organizations across a wide range of industries. In 1992, QAI established its Good Laboratory Practices (GLP) archives to store and manage clients’ research data and specimens. Then, in the mid-90s, QAI embarked on its first large-scale scanning project when a research consortium sought a more efficient way of distributing research data to its 35 companies. QAI’s document conversion services offering took off when Scott and Chris Swidersky (executive director and director of technical services, respectively) joined the company, spearheading the launch of its Information Services Division (ISD) in 1997. Leveraging the latest software and hardware technologies, the ISD helped QAI expand its client base, especially in the public sector. As QAI continued to scan and archive documents, it observed that many organizations still struggled to input, store, share and manage information at the enterprise level. Thus, in 2008, it formed DocPoint Solutions, offering end-to-end enterprise content management (ECM) solutions that utilize the Microsoft SharePoint platform. Since then, DocPoint and QAI have seamlessly worked together to fulfill the ECM needs of a wide range of clients. Over the years, QAI has worked with hundreds of clients, including large federal agencies; local government entities; universities and educational institutions; legal organizations; banking and financial firms; nonprofits and associations; and many more. The company has also held seven successful user conferences; received numerous industry and partner awards and recognitions; honed relationships with many of today’s leading technology vendors; and regularly participated in events and trade shows.